At the National Automobile Museum, we invite you to not just revel in our more than 200 glorious cars, but to relive their stories. 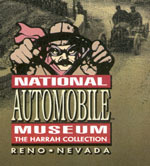 Walk through our cobblestone street scenes, honk the antique “ooga” horn, put on a period hat and coat and create your own stories in our photo car. 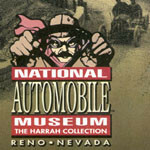 At the end of your journey, you’ll understand why we are “One of America’s Five Greatest Automobile Museums." Open Everyday Monday – Saturday, 9:30 a.m. - 5:30 p.m. Sunday, 10 a.m. - 4 p.m. For general visitors, we suggest approximately two hours to experience the entire Museum. If you are a car aficionado then plan to spend all day. Same day re-entry is allowed with valid receipt. Events for this year 2015 can be found by  Clicking this link to select the calendar of events.